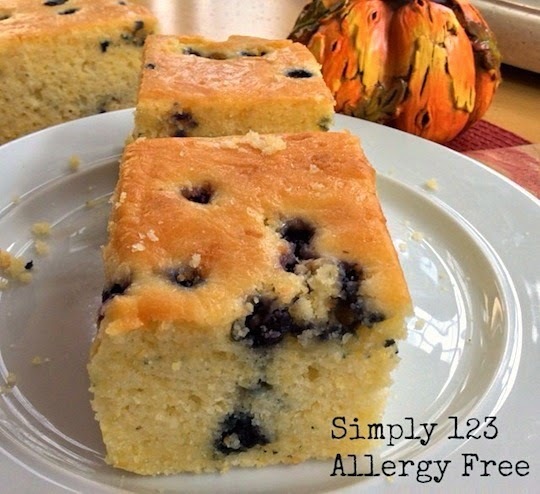 This mouthwatering warm Homemade GF/DF Blueberry Corn Bread recipe has a secret ingredient to keep it moist and tasty; blueberries! I absolutely love this recipe because you can alternatively use frozen blueberries to serve this year round. This simple melding of flavors is absolutely delicious and not your typical “eat it with chili” kind of cornbread. It is more of a delightful breakfast bread. The blueberries are mixed into the batter along with coarse ground cornmeal, making the texture more interesting, slightly crunchy, and incredibly moist. Heat over to 325 degrees. Grease a 8 inch square baking pan. In a large mixing bowl, combine corn flour, cornmeal, salt and sugar. In another mixing bowl, beat eggs, milk and vanilla. Slowly combine the wet and dry ingredients. Add the Earth Balance and stir. Add blueberries. Pour mixture into the baking pan. Bake for 35-40 minutes or until the edges turn golden. Use a toothpick to check that the center is done. Beautiful, Phyllis! I've always loved the combination of blueberries and cornmeal. Makes a great breakfast for sure! :-) Thanks for sharing on GFW this week! Yum! Sounds like the perfect bread for a cold Winter's day. My husband loves cornbread and I am going to have to try this for him. Thanks for sharing on Real Food Fridays. Pinned & twitted. Thank you Marla! have a great weekend and once again thanks for hosting Real Foods Friday! Thanks Barb! Have a great week!